Technology is revolutionizing means of communication, playing an increasingly more intimate part in consumers’ lives. Can this new digital situation solve the labelling issues the cosmetics industry is facing? 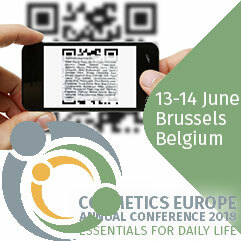 At least, that is what Cosmetics Europe has been working on, taking several actions to promote the digital list of ingredients. The European association presented them at the annual conference held in Brussels in June. In 2014, the SCCS Opinion on allergens that recommended to label over 80 of them – instead of the current 26 – was a clap of thunder in a clear blue sky. The idea of seeing this measure approved by the European Commission and transposed to a regulation had aroused emotion and raised much concern in the cosmetics industry. How can anyone imagine making the lists of ingredients that longer to add these new allergens to be labelled? How can this long enumeration of complicated chemicals names ‘fit’ on product labels? Would this information actually be relevant to consumers? Would it guarantee reinforced security, or on the contrary, would it be totally useless in practice? It is within this context that the project Future of Mandatory Consumer Information was launched by Cosmetics Europe four years ago. The aim was clear: reinforce the ability of the industry to meet consumer expectations, and even anticipate them in terms of product labelling and quality of the information provided. It all started by evaluating all the elements that should be indicated on cosmetics labels, in all their different aspects: raison d’être, target, presentation, and efficacy.